Thomas Ritter and his team of mercenaries are sent on a rescue mission into the jungles of Myanmar. On their return to London, ‘the War Boys’ are hunted down in retribution for the jungle raid and the hunters become the hunted in a fast-paced action adventure. Will Thomas and his team be able the retribution that has been turned towards them? David Ross Wood, the author behind the action and adventure in ‘Kneel to the Fallen’, has kindly shared a few minutes with me to about the action and adventure of this book and his writing career. David, let’s kick off our adventure today at ‘Kneel to the Fallen’. How did this book come to life? It is a sequel to the first War Boys novel, Horns of the Minotaur. Being a sequel, many of the elements in the book, like the characters, and their backgrounds are already created and ready to go on the new adventure. Looking back, how did these characters originally develop? It started with the lead character Thomas Ritter and then I added subsequent characters from different nationalities and backgrounds to give diversity and interest to the story. Were these elements of character diversity and story interest drawn from things that happened in your own life? Not life experiences necessarily but the book could not have been written without a lifetime of reading the stories that I personally enjoy. And I love that you’ve used this lifetime of stories, to contribute a new work for many others to enjoy. When you think about what the readers will enjoy in this book, what do you hope they will take away or enjoy the most? The best heroes are the ones with flaws because that means that they can learn something through the journey in the book. And in my experience, the best authors are the ones with flaws who have also learnt a lot along the way. What have you learnt from this book? I love to give detail to my stories and really enjoy the research necessary to accomplish this. During the course of writing, I learnt how to balance depth of story and technical detail with enough action to ensure the novel remained fast paced. Research can be one the most fun times of a writing project! And I’d love to know if you’ve been lucky enough to be able to extend your research to a literary pilgrimage? No, I haven’t but I would like to visit Ian Fleming’s gravesite in Sevenhampton, England. That’s a great choice. I hope you can get there soon! While you’re working on getting to Sevenhampton, I’m sure you’re working on at least one other writing project. What information can you sneak to us about your upcoming writing adventures? I am working on a historical piece concerning Australian soldiers fighting in the Middle East during World War One. A second project involves a downed spy plane pilot who is captured after crashing in North Korea. Wow, they both sound like they are going to be some awesome pieces of action-adventure reading! With all of this action happening on the page, do you find that you are ever exhausted by your writing? Or does this action on the page energize you to keep moving forward? I am a bit of a morning writer and write with energy up until midday then tiredness tends to kick in and while I am not as prolific in the afternoon I will attempt a few hours of research to use the following day. When you are in that productive morning writing mode, what or who is your central focus? Generally, I have an eye on where the story is going. I find that to some degree the story will present itself as I write thereby going in directions I didn’t necessarily plan when I began. How do you feel that your writing has progressed as you’ve been taken on different directions that each story has unexpectedly presented to you? I think it has become more fluid and confident. With Kneel to the Fallen, I feel as though the style is very much mine and not a conglomerate of other authors that I have read. Now, that you are seeing that you are able to create a solid style, have you turned your thoughts to the creation of an author brand? And if so, can you share a little of the steps and journey you’ve made down this path? I probably haven’t consciously given great consideration about creating my own author brand, however, I do have a self-publishing strategy. I would like to be known as an action writer and to this end, I have written common theme novels. Kneel to the Fallen is a sequel and I have also written a sequel to the first of my children’s novels The Time Tunnellers. I have then presented my website which hopefully strengthens my profile as an action writer. I love that you’ve centred your focus to be an action writer. What do you think has inspired you to be an action writer? I am inspired to write because I love to read. My late father read such authors as Ian Fleming, Alistair MacLean and Alexander Kent. I would read these books after he had finished with them and while I never as a child dreamed of being an author the wonder of a great story stuck with and still remains. I’m glad that the wonder of a great story has stuck with you through the years so that now you’re contributing your own tales to the action genre. David, thanks for sharing a taste of the adventure in ‘Kneel to the Fallen’, and I wish you the best of luck for you next action adventures! Excited to read the book we discussed today? Find it here on Amazon: ‘Kneel to the Fallen ( ASIN: B00IMOD7TM )‘. 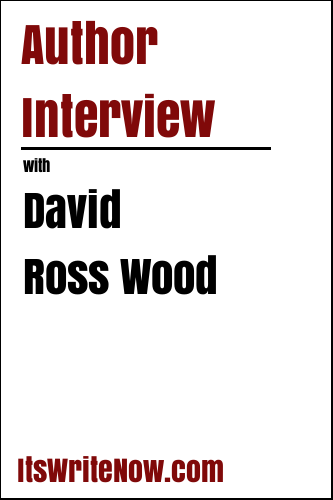 Want to find out more about David Ross Wood? Connect here!